Contemporaneous accounts of the Roosevelts ranging over seventy years. If you’ve been tearing through Ken Burns’s The Roosevelts, as we have, you already know what a small-time pundit like George Will thinks of Teddy and Franklin and Eleanor. (He attributes to FDR “the hope that complex problems would yield to charisma”; sounds like the Tennessee Valley Authority to me.) Perhaps more contemporaneous (and nuanced) appraisals are in order. 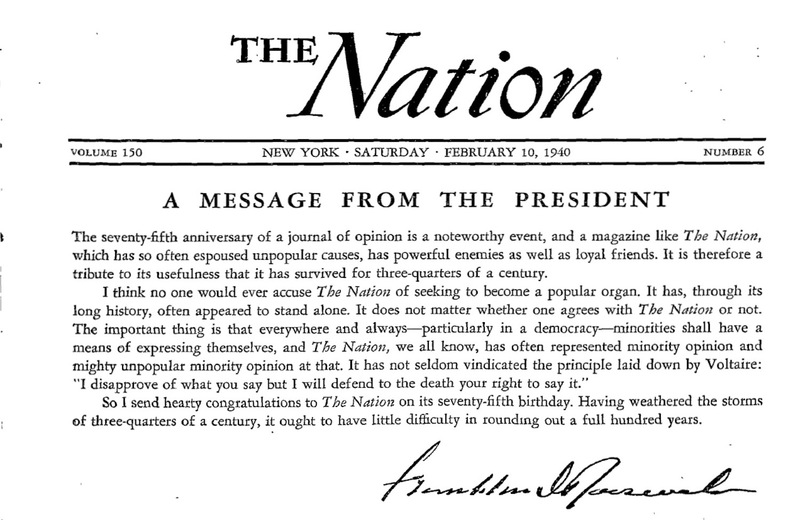 Here are ten pieces, ranging over almost seventy years, that The Nation published about the Roosevelts. The announcement that President Cleveland has requested Mr. Roosevelt to retain his place as Civil-Service Commissioner, and that he has consented to do so, will be received with joy by all reformers, and with equal dismay by spoilsmen throughout the country. Mr. Roosevelt has been the moving spirit of the Commission ever since he entered it. He believes not only in the theory of civil service reform, but also in putting it into practice. Throughout the Harrison Administration he pursued the spoilsmen ‘with a sharp stick,’ although they belonged to his own party, and he will not be any easier with them now that he will have to deal with Democrats. Mr. Cleveland would not ask such a Republican to continue on the Commission unless he himself ‘meant business’ in the matter of civil-service reform, as Mr. Roosevelt would not remain unless he had entire confidence in the President’s sincerity. The rational hope with which we wrote last week of the President’s condition was quickly falsified. On Friday, the reaction set in, and on Saturday, in the early morning, he passed away pathetically, without a struggle. Already his successor is at the helm, and the ship of state is on its way to unknown ports…. If President McKinley’s role was opportunism, his successor’s is strenuousness. This doctrine, long preached by Mr. Roosevelt, he was given the chance of his life to put in practice by the bringing on of the Spanish war; and his military prominence won him, by steps needless to enumerate, the place he now occupies. How far strenuousness may carry him, especially in foreign affairs, we shall not venture to predict. Visions of what is possible have mingled with the humane and sympathetic motives for desiring President McKinley’s recovery. Roosevelt quickened the pace of national life by his own mental and physical speed. His special contribution, however, was not the discovery but the direction of strenuousness. The captains of industry had been strenuous enough. He found a new object for physical and mental energy on the grand scale. More than any other man of his time he made political eminence a prize of the first order by his own unequivocal preference of public service and glory to private opulence and ease…. This alteration of the national psychology was of profound importance. It marked the difference between a nation headed for decadence and a nation entering upon a renaissance; and Roosevelt’s service in bringing it about can hardly be overvalued. Some appraisers of his merits say that his most notable achievement was building the Panama Canal. I should say that his most notable achievement was creating for the nation the atmosphere in which valor and high seriousness live, by clearing the air of the poisonous emanations of ‘superior’ people. From all the controversy about him which will be summarized during the campaign, Governor Roosevelt has conclusively removed one factor: any fear that his physical handicap detracts from his efficiency and activity as a governor. The opposition naturally played upon this fear in 1928, attempting to depict him as a sort of invalid; and to a milder degree even some of his supporters had misgivings. He has proved himself not only a prodigious worker but one of the most mobile governors in the history of the State. In his arduous summer good-will tours of the State he has worn out his staff and newspaper correspondents, but not himself. The energy which he uses in propelling himself must be a drain on his large frame, but it is not revealed either in his health or in his temper. He was markedly fresher at the end of his second legislative session than at the end of his first. He has surmounted his handicap so handsomely that it can longer be a feature in his campaign. Franklin Roosevelt has so far swept everything before him with the strength and velocity of a March wind. His measures have been designed with consummate skill to give the country what it most desires: a sense of vigor and action. The slow results may fall short of the demands of the crisis and so prove ultimately disappointing, but the first effect has been thoroughly satisfying. One may doubt the wisdom of any one of his measures and yet be won by their form and manner of presentation—so refreshingly in contrast to the dull and ungrammatical pronouncements of his unlamented predecessor. Mr. Roosevelt’s messages have been direct, terse, vigorous; his public statements lucid and simple. His address to the people over the radio was strikingly effective, partly because his words brought into the room a friendly, personal tone to which the most skeptical listener must have responded. His expression was varied and forceful, but never oratorical; he did not ‘alk down.’ His approach to the press in Washington has been equally successful. He has abolished the subterfuges behind which Harding, Coolidge, and Hoover took refuge. He employs no ‘White House spokesman’; he demands no questions submitted in advance. He talks to the correspondents face to face and answers their questions directly and without preparation. Finally, he shows no inclination to utilize the old tactics of silence and deception as methods of ‘restoring confidence.’ As we go to press he is insisting upon the continuance of the Senate inquiry into banking practices…To us this act is an encouraging sign that Mr. Roosevelt realizes how much remains to be done before the financial structure can be considered sound. All of these attitudes reveal him as a person of courage and candor. Mr. Roosevelt’s smashing triumph has left the country dazed and happy. A Roosevelt victory had been expected by most of the political observers, but an electoral vote of more than 500 and a popular majority of about nine million are more than a victory. They are the crushing, unmistakable answer of the American rank and file to all the powers and principalities of reaction, now and to come. It is still hard to believe, but true. And each man in his own heart is happy that he stands massed with millions of his fellows in his desire for a decent living and a decent world…. We should like to take Mr. Roosevelt at his word. We should like to believe that this fight of his—against the vested interests, against the holding-companies and the market riggers, against labor spies and company unions and slums—is really only in its initial stage and that the best is yet to come. But we must beware of being over-sanguine. Mr. Roosevelt has had four years of the Presidency, and after four years the will to reform slackens unless it is deeply rooted and massively fortified. Mr. Roosevelt has reason to be a tired man. He is also a sensitive man. He does not like being disliked and being hounded as a traitor to his class. His is, most important of all, limited in his vision by his antecedents, his education, his class roots. Already there is talk of healing the scars of battle, and there will be more of the same talk for the next months. By all means let us have peace. But let us not fling away all the fruits of victory in our desire for the goodwill of all groups. President Roosevelt’s hold on the imagination of people everywhere is a phenomenon whose immense political importance will be even more apparent now than while he lived. We shall realize now to what degree he was identified in the minds of men and women in other countries with the disinterested power of America, its reckless vitality, its commitment to the cause of freedom and international recuperation. All these qualities with which a suffering world has hopefully endowed this country were embodied in the person of our dead President. To countless millions, he was America. We shall realize, too, how completely he had come to represent in our own minds similar elements in the nation’s domestic make-up. The ordinary people of the Untied States had, to an extraordinary degree, accepted the President’s acts as a measure of the country’s advancement and consigned to his hands their interests and hopes. They did not trust the Democratic Party or the Administration as a whole; they trusted Roosevelt. Even when he seemed to compromise or retreat they were content to wait until he found it expedient to swing back to his own basic line. To millions of Americans, he was the New Deal, all it gave or promised them personally. The political consequences of this sense of identification between the leader who has gone and the people who followed him will be felt in every part of our society. Men fighting in the mountains of northern Italy, workers on assembly lines in Detroit or Los Angeles will be inclined to new ways of thinking and acting because he is dead. Heads of state will orient their policies differently. Business men will make new plans. Everybody ought to be grateful that we have in the White House a woman who thinks for herself, who has vision, and who is well aware that this country is not in a happy condition and needs a radical overhauling. I especially admire her serenity in carrying on her work as she sees fit despite the malicious gossip relating to herself and her husband, deliberately set afoot by the rich and prosperous who are so bitter against the New Deal and its author, even to the extent of believing, incredible as it sounds, that the President is a regularly enrolled member of the Communist Party. Because of Mrs. Roosevelt’s sympathy for so many good causes, I am quite willing to overlook the banality and the intellectual poverty of her diary, now syndicated in many dailies, and to put aside my feeling of regret that she makes as many speeches as she does and talks so frequently over the radio, even if the latter is for charity. These regrets are impersonal—by which I mean that no one can write as much and talk as often as Eleanor Roosevelt and not run pretty thin. They do not counterbalance the usefulness of her example in the ways that I have already cited. She is of course bound to support her husband’s policies and is indubitably limited by her relationship to him, I cannot but believe that if she were a free agent she would give us some extremely effective criticism of the whole vacillating and dangerous handling of the relief problem. I think she might also have something cogent to say about the failure of the housing program and other errors of the Administration. Because the world was human to her, people, in her presence, took themselves upon her terms. They talked like human beings—were even unashamed to feel like human beings. With her there on the platform, or in a chair by the window, or merely passing on the street, things took on their old human proportion again and the slogans somehow withered and went away—even those enormous outdoor slogans of American suburbia, and those prestige-building, inside slogans of American intellectualia and the sky-high slogans of the various cults and creeds. Things got simpler where she was. Good became good again, and nonsense nonsense, and evil evil, and a man could love again and even pity. It was for this reason, of course, that the doctrinaires of all the doctrines railed against her or patronized her with their silence. She left them nowhere at all to stand. And it was for this reason too, I suppose, that she never answered them. It was not that she ignored them. She knew what they said and some of it—the worst of it—must have hurt her. But what she meant and what they meant were so far apart that there were no words left in which to meet them. Doctrine is what life leaves behind like a skim of ice above a run of water: her thought was for the water. Or not perhaps her thought: her being. For it was her being that counted. What renewed the fell of things where she passed was not what she thought or said but what she was. It was Eleanor Roosevelt, a great lady in a great tradition, who was also a woman and who saw the world as women see it and who gave it life. That, perhaps, is the word one needs: that she gave our time her life. All of it. Not just the end of it, the death, but all of it—the whole, full life.